Do we need crystals for our devices? Samsung seems to think so. I seem to remember receiving some for a very old LG camera phone (before they got smart), many moons ago. The “Swarovski for Samsung” collaboration follows a successful accessories partnership between the two brands at the recent Mercedes-Benz Fashion Week in New York. The collection marks the first time in over 100 years that Swarovski has partnered in a collaboration of this scale, fully integrating its branding into the Samsung collection. The collection of crystal-encrusted Galaxy S5 covers and Gear Fit charms brings together distinctive Swarovski craftsmanship with Samsung’s technological expertise. 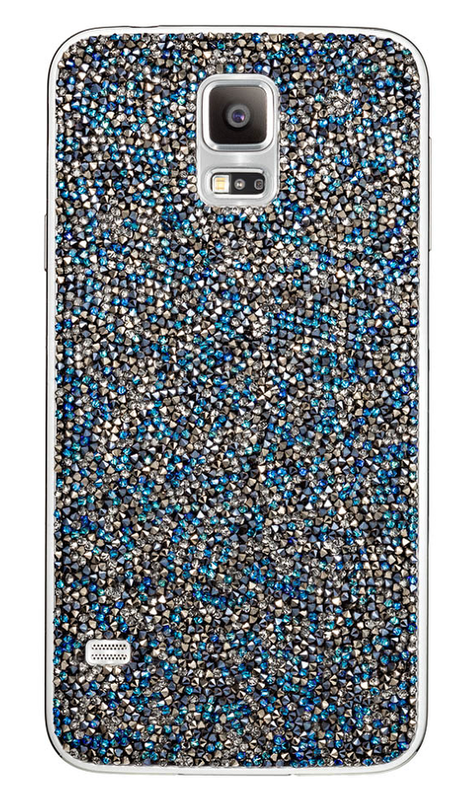 Through a specially developed application process, Swarovski Crystal Fine Rocks have been embedded onto the back cover of the Galaxy S5, while two crystal effects have been merged into one motif as an extra design feature. The Gear Fit Charm Sliders have been specially designed to provide versatility for wearable devices. The charms are available in a wide variety of colours and styles, with the option to mix-and-match to suit a range of occasions and your individual style and taste. Bar colours include Brown, Golden Shadow and Crystal whilst dangle styles feature Siam Heart, Light Rose Heart, Crystal Skull, Anthracite Skull, Crystal Star, Blue Star and Golden Shadow Lips crystals. To view or place an order, go here.